How can I have my hands analyzed by Jena Griffiths? You can have your hands analyzed wherever you are in the world. A hand printing kit is sent to you by fast mail. Within minutes your hand and fingerprints are made. Post (or email ) your prints to Jena. You speak with Jena on Zoom, Skype or phone. You get video replay of call, with the markers on your hands highlighted as we talk. Ask Jena to analyze your hands today. Plus your Life Purpose Chart and reference document. Your hand analysis is invaluable. Immediately, it has given me clarity and a direction to focus and I’m truly grateful for this. I have listened to the recording twice since and I continue to gather new insights. Your website is a wonderful resource too. I truly admire your work, your natural, warm manner, understanding and support. ‘What’s my Life Purpose? That was the question I wanted to get an answer to when I signed up for a hand analysis with Jena Griffiths. I was contemplating taking a completely different route in life. This time I thought it would make sense to really check if that was the right move as it was quite a big investment both financially and emotionally. ‘I didn’t know what to expect but the Hand Analysis Reading felt more like a proper coaching session than anything else, but instead of getting questions from a coach my hands were leading the way. Jena is extremely knowledgeable, professional and detailed in her work and she was giving me verification after verification on my life purpose, my life lessons and what type of careers would make sense for me. This helped me to start looking at my strengths that I’m already born with, instead of continuing to bump against obstacles and stay in the feeling of being stuck or in the wrong place. 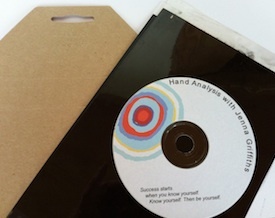 ‘Dear Jena, I wanted to shoot you an email to say THANK YOU for my hand analysis and consult! I have felt a sort of uneasiness for a couple of years that there is something more for me to do with my life, but still enjoy trading. So I have felt quite conflicted. I realized after the consult yesterday that I don’t have to choose between trading and something else. It all makes sense now that I have a mind that needs to be trading, but also a soul that needs to express itself more fully. I know now that I can continue to trade, but also bring about my creative side in the form of being an author. I have a list of potential books to write that have been on my computer for years and I added to it today with 10 more ideas…. I feel so free like I’ve been let out of the shackles I’ve been trapped in thinking I can only choose one purpose. My mind has been getting fulfilled, however my soul has been screaming it needs to do more than just make a lot of money. Realizing it’s been there for me to see all along in my own hands is humbling. Thank you for pointing out to me what my soul has been prodding at me. You have an amazing gift Jena! Thank you for listening to your purpose so the rest of us can find ours! ‘Fantastic analysis as well as your wonderful ability to make me feel comfortable in being vulnerable to opening up to you…which I rarely ever do! ‘I booked an appointment with Jena, and am very glad I did. I am not one to run from astrologer to psychic and so am very careful of who I open myself up to, as it is so important to do this type of work with people with deep integrity and real spirituality. Jena is such a person. ‘I actually got my question of “what is the purpose of my life” answered. And I knew it was true as my body responded with tears; A sure sign that she hit on something real and true. I thought such highly of the reading that I had my husband do a reading as well, and he also loved it. I am writing to let you know that I have been overcome by a feeling of elation since our session. This is quite significant, as I have been in a state of quasi despair over the last few months, or shall I say years! When you spoke to me about what my prints revealed, it felt as though you speaking directly to my soul,and I felt instant recognition in all that was being revealed.I could not contain the tears at one point, but the tears were not of sadness, but of joy, perhaps the joy that one feels when being seen, heard and validated for the first time.That’s what it felt like for me, after a lifetime of invisibility and self doubt. It felt as though all the dots that had been scattered around me at random in my life finally came together and formed a clear path before me that became illuminated. It is a path that my soul recognized instantly as it felt so comfortable and familiar. I truly have no words to thank you for such a gift. I myself am a psychotherapist, and have sought therapy myself for many years in an effort to understand my struggles in searching for my soul’s purpose, my true purpose!. I have spent thousands of dollars for answers that I had inside of me all along….Therapy drove me away from my purpose in that it cast doubts in my mind, while what you were able to do was draw me back to my soul’s purpose and validate all I have been feeling as true throughout my life. I feel, after our session, a renewed commitment toward Self,a desire to honour my self and accept myself for the uniqueness that I am, and embrace the challenges that I face rather than hide away from them, for without them, there is no self realization. As you stated with such wisdom, our challenges in life are our greatest teachers, and thus they should be blessed. - Aldine Dallas. South Africa. “Jena was my personal guide and my personal guardian angel for 2 hours. On my journey with Jena we had an encounter with my inner master mind and its inhabitants: my inner friends, my resources, and my sub – personalities who can help me in any project I want to bring out into the world. Thank you Jena for this precious journey into my inner soul and it is such an enriching experience to encounter myself every day and stay connected with my inner spirits and friends and to continue this exploration. Further questions please contact us via email.